Thursday March 16th 1893 I made a fire in the parlor this morning and cleaned them and Mothers room. We brought the furniture out of the S.E. room and put a bed in the parlor for Lee. Will hauled wood over town. It snowed in the afternoon. Friday March 17th 1893 Mother helped me and I got my table cloth and napkins hemmed and washed out. Will took over more wood. I made lace in the evening. 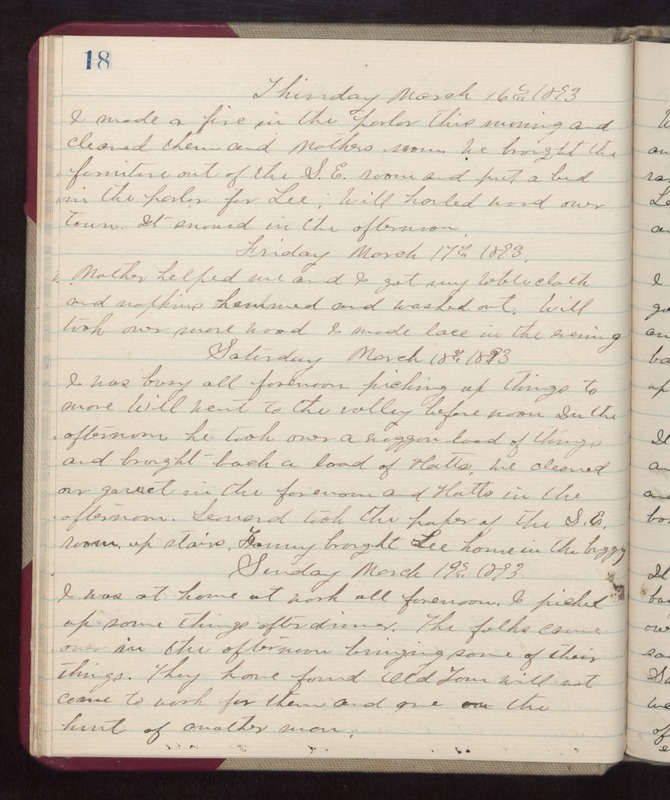 Saturday March 18th 1893 I was busy all forenoon picking up things to move. Will went to the valley before noon. In the afternoon he took over a waggon load of things and brought back a load of Hatts. We cleaned our garret in the forenoon and Hatts in the afternoon. Leonard took the paper of the S.E. \room up stairs. Fanny brought Lee home in the buggy. Sunday March 19th 1893 I was at home at work all forenoon. I picked up some things after dinner. The folks came over in the afternoon bringing some of their things. They have found Old Tom will not come to work for them and gone on the hunt of another man.